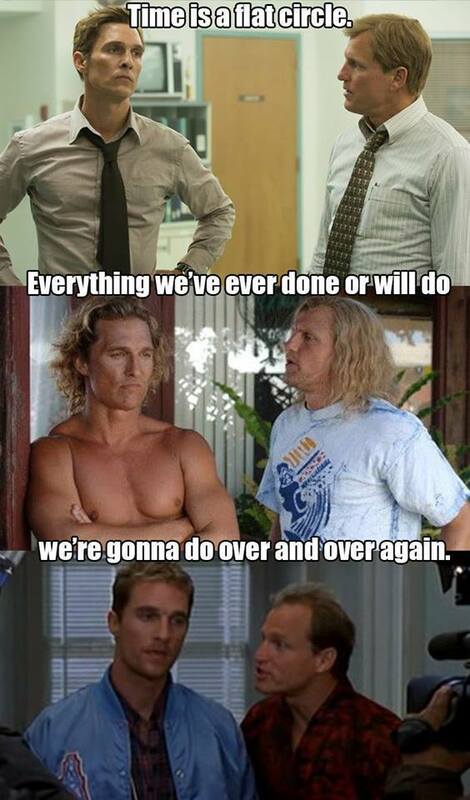 Watching the debate over Arizona’s SB 1062 (better known as the state’s anti-gay Jim Crow law) unfold this past week, I couldn’t help but think of the already iconic line from Matthew McConaughey’s “True Detective” character Rust Cohle: “Time is a flat circle.” As is always the case with the nihilistic and willfully esoteric Cohle, it’s not entirely clear what he’s trying to say with the metaphor, but we get the gist: Like Nietzsche’s “eternal return,” Cohle’s flat circle theory holds that all of us are destined to relive every moment of our conscious lives, forever. It’s as if we all were stuck in the late Harold Ramis’ “Groundhog Day,” but instead of repeating a single day, we repeat our entire lives. The similarities weren’t merely superficial, either. Sure, the play, written by Pulitzer prize-winning playwright Robert Schenkkan (who obviously did his homework), was littered with hysterical charges of “fascism” and “socialism” and “big government” from no-name Dixiecrats that most of us never knew or were happy to forget. And of course these moments brought to mind much of the anti-Obamacare rhetoric that has emanated from conservatives during the past five years. But the parallels went deeper than that. It wasn’t just the language that sounded so familiar, but the logic behind it, too. Whether conservatives were defending Jim Crow proper or the Southwest’s latest variant, their worldview, all these years later, was disturbingly unchanged. To explain what I mean, allow me to cite two of conservatism’s leading lights: Kentucky Sen. Rand Paul and all-around media mogul Glenn Beck. As the opposition to SB 1062 increased in fervency and numbers, the usually loquacious Paul was, unlike his fellow Senate Republican John McCain (who opposed the bill), deafeningly mute. Anyone familiar with Paul’s history knows why: Because the obvious presidential aspirant wanted to avoid reminding people of the unfortunate 2010 interview with Rachel Maddow in which he stated that, even today, he would not support the government-run dismantling of Jim Crow. “I don’t want to be associated with those people,” Paul said, referring to white supremacists who’d bar blacks from their restaurants, “but I also don't want to limit their speech in any way…” Paul’s orthodox libertarianism told him that the freedom to discriminate was too valuable, too sacred, to let the federal government stand in its way. Like Sen. Barry Goldwater did in 1964, when he voted against the Civil Rights Act, Paul argued that the Constitution had no room for anti-discrimination. High-profile though they may be, Beck and Paul are hardly the only conservatives who still cling to a vision of freedom that many Americans wrongly thought was swept into Reagan’s “ash-heap of history” decades before. Tucker Carlson — who, if Paul is to be Goldwater, we must describe as today’s version of the braying, segregationist Dixiecrats — was adamant in his defense of SB 1062, saying on Fox News that opponents of the bill were advocating for “fascism” and had gone “too far” in their quest to prevent state-sanctioned bigotry. “Everybody in America is terrified to tell the truth,” Carlson warned, “which is, this is insane, this is not tolerance, this is fascism.” Tellingly, when his sparring partner, Fox’s house liberal, Alan Colmes, asked Carlson whether he would have supported the Civil Rights Act, the editor of the Daily Caller could only respond by saying, “Don’t bring [that] into this,” with a sneer. The fact that this very same logic recently undergirded a century of Jim Crow seemed to escape Shapiro. Either that or he, like W. James Antle III of the American Conservative, was content to dismiss comparisons to Jim Crow on the grounds that Arizona is not the Jim Crow South and 2014 is not the mid-’60s. “People often argue for or against the civil-rights laws of the 1960s on the basis of abstract principles,” Antle wrote, “but they were in fact a reaction to a very specific set of circumstances.” (This is an argument that, more than anything else, raises the question as to whether this is the first time Antle’s come into contact with an analogy.) Perhaps Shapiro, like Antle, was content to support the bill not because it wouldn’t give the government’s imprimatur to homophobia, but because such an outcome is, in their minds, “not very likely." After all, what's a little discrimination in the grand scheme of things? For all of her many flaws, Jan Brewer decided on Wednesday to refrain from applying her conservative “principles” in such a “tragic” manner, opting instead to veto the bill and maybe — just maybe — push her party that much closer to joining the rest of us in the 21st century. And while many conservatives received the veto as a crushing disappointment, or even a step toward “slavery,” I’d caution my right-wing fellow citizens against slipping into outright despair. If the events in Arizona have taught us nothing else, they’ve shown that time is indeed a flat circle; future right-wingers will have plenty of chances to keep getting this most basic question of freedom terribly, terribly wrong.